What are the best low compression golf balls for kids? Kids generally have slower swing speeds and as a result low compression golf balls that fly further are generally the best golf ball option for them. However, golf balls are a very individual thing and while there are some technicalities in choosing the best golf ball for your junior golfer, it will often come down to the look and feel. If your junior's favorite player uses Titleist then he/she may want to also. However, that does not mean that the Pro's "Tour" golf ball is the best performing golf ball for your junior. In fact, in most cases the best golf ball for juniors is different from Tour Pros' due to the difference in swing speed. This is also the reason that recreational lady golfers and senior golfers should generally use a different ball than the Pro's. There are many cool golf balls for juniors including various brightly colored options. This article provides general information to help you make an educated choice of golf ball for your junior golfer. We highly recommend golf ball fitting, although we understand that this is not possible for everyone, so we have also included some additional thoughts on this topic below. This article provides detailed information on the technical considerations in choosing the right golf ball and also a list of recommended golf balls for juniors including the compression rating, construction and price point for each. If, however, you are in a rush and want to see some balls that are recommended specifically for your junior, below is a quick 5 question quiz that will provide you with a short list of suitable golf balls. This quiz can also be used to find the best golf ball for beginners, ladies and seniors. When choosing a golf ball there is usually a trade off between distance and feel/control - i.e. balls with the best distance for slower swing speeds generally do not have the best performance characteristics around the greens (they are usually low spin golf balls). There are, however, some top rated golf balls that offer both good distance and control. If your junior is just looking for more distance then they should be playing with low compression golf balls. Compression means that the golf ball momentarily changes from a sphere shape to an elongated oval (and back) at the moment of club impact, thus transferring energy from the club face to the ball as it momentarily flattens and then rebounds. Compression ranges from approx. 40 to 110. Golf balls (or their packaging) are often marked with the compression of the ball. A 40 to 80 golf ball compression is appropriate for most younger junior golfers. Golf balls with compression ratings of more than 90 are generally used by advanced players with higher swing speeds. For example, the Titleist Pro VI is a medium compression ball with a compression rating in the high 80's while the Pro VIx is a higher compression ball at around 100. Juniors with a swing speed over 80 mph could consider using the Pro VI. The compression rating of a golf ball is largely driven by its construction. Balls are either 2-piece construction or multi-layer construction. A 2-piece ball has a one large solid core surrounded by an outer layer. 2-piece balls are suitable for juniors looking to maximize distance. 2-piece balls have less spin than multi-layered balls and therefore some performance (e.g. stopping on the green) is usually sacrificed. Note that, although low spin golf balls do not check up as quickly as higher spin golf balls, they also do not have as much side spin and as a result longer shots (e.g. drives) may be more accurate. Popular 2-piece balls include the Titleist AVX (a premium, soft, low spin golf ball), Titleist Tour Soft, Titleist DT Trusoft, Titleist Velocity, Top Flite Bomb, Top Flite D2+, Top Flite XL, Bridgestone Lady, Bridgestone Extra Soft, Callaway Supersoft, Srixon Soft Feel, Wilson Staff Duo Soft, Taylormade Project (a) and (s), and Taylormade Noodle. A multi-layered ball construction will generally be a little shorter off the tee for most juniors (e.g. juniors with driver swings speeds less than 85 mph) but will provide better feel and control into and around greens. If juniors are regularly playing courses where stopping the ball quickly (e.g. for short irons and wedges) is critical then you may want to consider a multi-layered ball that provides more spin. Most tour performance balls are multi-layered - e.g. the Titleist Pro VI and Bridgestone Tour B's are 3-piece balls. The Titleist Pro VIx, Callaway 2018 Chrome Soft, Srixon Z-Star Tour, Volvik S4 are all 4-piece balls. Taylormade TP5's are 5-piece balls. A newer ball to the market that we like is the Wilson Staff Duo Urethane. It is a 3-piece, very low compression golf ball (55 rating), that still provides plenty of spin and is very suitable for juniors. The Volvik Vivid is another low compression, Urethane cover ball and kids will like the colors. The two most common types of golf ball covers are Urethane and Ionomer (Surlyn is the most common Ionomer material). Urethane provides better feel and control but is not a durable as Surlyn. Surlyn usually has lower spin off the tee thus a little more distance. Since Urethane provides higher spin on irons and wedge shots, it is generally preferred by advanced players. The downside is that Urethane is more expensive. Balls that provide both good distance and performance on/around the green usually have a Urethane or similar type cover. Advanced juniors playing tournament golf will benefit from Urethane cover balls. Many manufacturers will provide good detail on their line of golf balls, such as the excellent Bridgestone chart below. Although this is not a technical consideration, it is just as important. Does your junior like the look of their golf ball (cool golf balls will make the game more enjoyable for younger kids), and does it feel good to them off their driver, irons, wedges and putter? The look of a golf ball can also impact performance. For example the Callaway Truvis technology (actually just a design like a soccer ball) apparently can actually help with focus and visibility. Truvis stands for True Visibility and there might be something to it - take a look at the balls pictured below (click to see full size image), the balls are the same size but the Truvis design does seem larger and inspires a little more comfort at address! As far as "feel" goes, some high compression golf balls can feel like hitting a rock, especially on cold days when the compression of the ball is even higher (side note - consider using a softer compression ball on really cold days, your junior will thank you for it). In general we find that most kids prefer the feel of a soft compression ball and/or a Urethane cover. 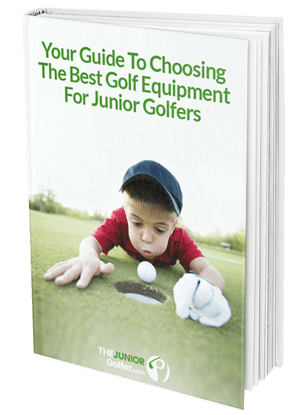 To narrow down ball selection for your junior you can do some basic ball fitting yourself or with the assistance of a professional fitter or your child's golf coach. A professional fitter or a coach with a trackman or other flight scope can provide the best feedback on ball speed, spin, carry and total distance. Many large golf shops will also provide the opportunity to hit various balls in their hitting bays, although you may need to buy and bring your own balls to some. Most of the major ball manufacturers have a ball fitting questionnaire on their sites which can be helpful also. If you want to do your own basic fitting, buy a sleeve of the various makes and model golf balls that you want to try and hit them on an outdoor launch monitor. Two good quality and relatively inexpensive launch monitors are the Swing Caddie SC200 (approx. $275, or the SC100 is less than $200), and the Ernest Sports ES14 (approx. $495). The SC200 does not provide ball spin number but has all other basic data that you need. The SC200 is compact and sits behind the ball as opposed to the ES14 which is larger and sits off the front right of the ball, which could be a problem in the event of shank! The SC200 is also significantly smaller than the ES14 (the size of a smart phone vs the size of a very thick book). A launch monitor will tell you which balls perform the best on full shots (distance, spin and direction) - disregard mishits and compare the average of well struck shots. Then also use all the balls for pitches, chips and putts to see which you like the feel of. If you do not have access to an outdoor launch monitor you can take your sample of golf balls to your local course at the end of the day when it is quiet and try them out on a nice wide fairway. Record the distance of well hit shots until you have a large enough sample to determine which ball actually goes further. By doing this you can narrow down the selection and repeat the process until you determine which is the longest off the tee and which you like the feel of the most. The golf balls listed below are good choices for kids with slower swing speeds (e.g. less than 80-85 mph) and driver carry distance of less than 200 yards. Note that these top rated golf balls are not just for younger kids - many of them are also very good options for older kids, teens and adults with higher swing speeds. Given the huge amount of options available and personal preferences, this is not intended to be an all-inclusive list. Note that if you are viewing this table on a PC/Mac or Tablet then you can click on the column headers to sort the table data. * Price for 12 balls: $ = < $25 / $$ = $25-$35 / $$$ = >$35. The golf balls listed above could also be used by ladies, seniors or amateur golfers with slower swing speeds who want to maximize distance without giving up too much performance. Yellow golf balls have become more popular and many of the options above are available in yellow and/or other colors. The links above are to new golf balls but refurbished golf balls can be a good option for kids (especially for practice) and they often can be found on Amazon for up to 50% less than new balls. Although many of the low compression golf balls in the above table can also be used by golfers with driver swing speeds above 85 and who can carry their drivers over approx. 200 yards, these juniors may benefit from multi-piece golf balls with medium compression ratings and Urethane covers. Some good examples of quality, medium compression golf balls include Titleist Pro VI (90 compression rating), Taylormade TP5 (83 compression rating), and Bridgestone Tour B X or XS (75/85 compression rating). The Pro VIx, TP5x and Tour BX are all approx. 10 points higher compression rating than the Pro VI, TP5, and Tour B RXS respectively. Kids love anything that is glow in the dark and glow in the dark golf balls are no exception. Using a pack of glow sticks you can make a glow in the dark course and have some fun with the kids. Pictured above, the PGA National Resort & Spa in West Palm Beach, sets up a great night-putting course at many of its junior golf tournaments. We recommend using 22 inch and 8 inch glow sticks for setting up your course. With good quality luminous golf balls (i.e. as opposed to LED light up balls that are used for putting), you can even play a few shorts holes (e.g. as par 3's) in the dark with your kids (take a flashlight or headlamp). Some golf clubs even have occasional evening or night golf outings for members. Lots of kids love DIY decorated golf balls. Some colored sharpies will do the trick - let them draw their favorite pet, super-hero or scary face. We recommend using a lower cost ball for them to decorate! Note that heavily decorated golf balls, like the cool golf balls below, can leave colored marks on the face of golf clubs but wont significantly affect performance. We also like the various Tin Cup Ball Marker designs and kids often have more than one of these in their bags at any one time. Get a pack of different colored sharpies with it and kids will enjoy the creative process of marking up their golf balls. Golf ball stickers are also a nice idea for kids and there are various different designs available. Golfdotz are good quality, highly rated and sold online and in various large golf shops. This is an easy way to turn otherwise boring golf balls into cool golf balls for both kids and adults. Note that some "decorated" golf balls are not meant for regular play, will likely not perform very well, and may even be illegal to use in tournaments. An example of these would be balls found in baseball parks (e.g. with team logos), amusement centers, tourist attractions etc. You can even order your new Taylormade Golf Balls with personalized Halloween Themed logos - hit it scary! Customize your favorite golf ball with an image, number and more! Plus Free Shipping! Kids love novelty golf balls such as the floating ball, the unputtable ball (off balance), the unwinding ball and (especially) the exploding ball. Make golf fun and grab a couple of exploding balls for the next outing with your kids! Low compression golf balls are generally good for kids - or anyone with a slower swing speed. If it is purely distance you are after then consider an Ionemer (Surlyn) cover. However, low compression golf balls combined with an Ionemer cover are usually a low spin golf ball, which can result in it being difficult to stop quickly on the green. The upside of a low spin golf ball is that that it will not spin sideway as much and may reduce the impact of slices and hooks. We highly recommend that your junior tries out a few of the low compression golf balls listed above, either in a golf ball fitting session or on the course. We would love to hear about your results from trying out some of the top rated golf balls in this article!